Chocolate – A Healthy Pinch. If you’re like me, when time is limited and you’re hungry, the snacks you tend to reach for may not be the most nourishing. Though I try to stay away from my 3 year old’s Goldfish crackers, sometimes they’re the easiest to grab and who doesn’t love Goldfish crackers?? However, five handfuls later, I’m still hungry and just ate waaaay more crackers than I should have. So now I’m really trying to make healthy treats to snack on that will satiate those hunger pangs throughout the day. Enter these cute, little energy bites. I think of these as homemade Larabars because they both contain real ingredients and are a cinch to make. Dates are the only sweetener and do their job of holding everything together. Using dates and whatever nuts you have on hand as the base, you can completely customize the flavor of these little bites. So here I had cherries and chocolate (cacao powder), which is always a winning combo. Then you just blend everything in a food processor, roll the mixture into little balls, and refrigerate. Boom. Now you’ve got healthy snacks on the go! These snackable, poppable energy bites are are great to have on hand when hunger pangs strike. I love these because they’re so customizable, though the cherry and chocolate combo are my favorite. Just think of these as homemade Larabars! Soak the dates in hot water for 10 minutes if they are dry or hard. Place dates in a food processor and blend until they are in small pieces. Add the remaining ingredients and process until everything is combined and has a finely ground consistency. Using a 2 tbs cookie scoop, scoop mixture into balls and refrigerate in an airtight container. These blondies. I can’t get over them. They’re currently sitting on my counter and it’s taking all my willpower not to grab one every time I walk by them. Which is a lot. As soon as I saw this recipe, I knew I *had* to make it…but with a few additions of my own, of course. So after dinner has been served, dishes have been done and kitchen has been wiped down, I turn the oven back on because the day is never really over until I’ve had my cookie for dessert. I’ve gotten in the habit of freezing a freshly-made batch of cookie dough so that I won’t eat half the cookies throughout the day. It’s the perfect solution curb my mindless snacking and allows me to really savor the one cookie I’ve baked for myself after dinner. Because it really is a treat. This cookie dough is special. It’s not gluten-free. Nor is it vegan. And I definitely wouldn’t consider them a health food. But sometimes a special chocolate chip cookie is just what we need to put a period on the end of the day. 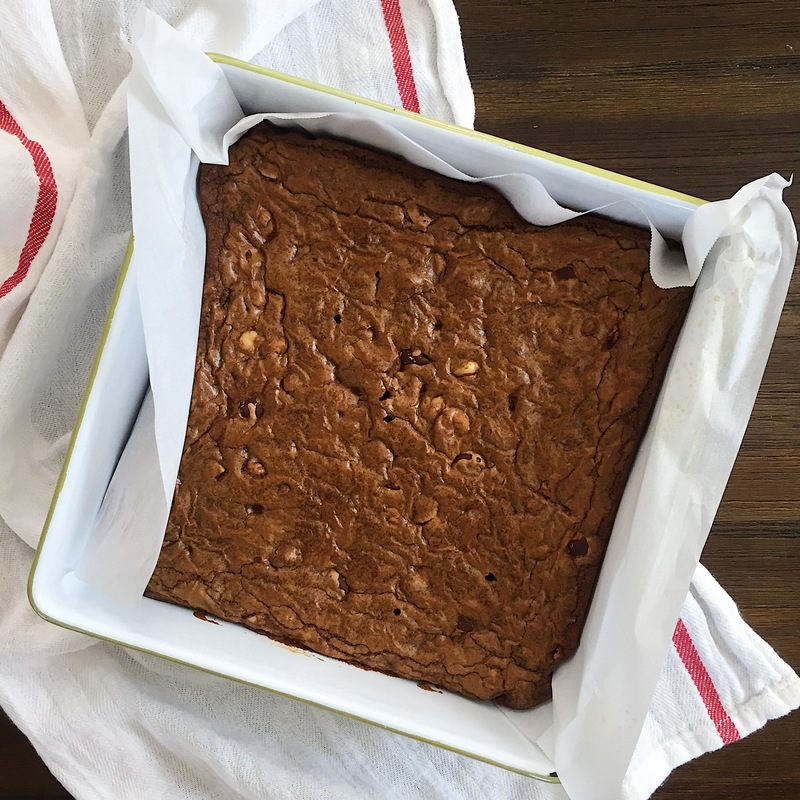 I’ve made this recipe numerous times and have fallen in love with the addition of tahini in the batter because it creates a subtle depth of flavor even though the tahini itself isn’t really that pronounced. This time there was a higher chocolate-to-dough ratio so they were super gooey, almost falling apart when taking a bite. Feel free to use less chocolate if desired. Just because, I also threw in some espresso powder since coffee is never a bad addition with chocolate. Finally, I whipped up sesame smoked sea salt to top the cookies, as one does. (say that three times fast). All I gotta say is…make these cookies. A tahini chocolate chip cookie spiked with espresso powder and topped with sesame smoked sea salt. The very best treat to end your day! In the bowl of an electric mixer fitted with the paddle attachment, cream together the butter, tahini and cane sugar on medium speed until light and fluffy, approximately 5 minutes. Add in egg, egg yolk, and vanilla and continuing mixing on medium for another five minutes. In another large bowl, sift the flour, baking soda, baking powder, salt and espresso powder together to combine. Add the flour mixture to the butter mixture and mix on low until just combined. Toss in the chopped chocolate and stir them into the mixture by hand with a rubber spatula or wooden spoon. Line a baking sheet with parchment paper and using a cookie scoop, scoop out dough balls and place them on the sheet. Wrap the baking sheet in plastic wrap and place in freezer for at least 12 hours. This step is important because it allows the gluten in the flour to relax, giving way to a more tender and chewy cookie. At this point, you can bake 1 or bake them all. I love storing cookie dough in the freezer to have on hand when the craving strikes. Plus, not having a jar of chocolate chip cookies on the counter to snack on which to snack freely helps with self control. When ready to bake, preheat oven to 325º and line a baking sheet with parchment paper. space cookies at least 3” apart to allow for them to spread. Bake for 13-16 minutes, until just golden around the edges. Even though they may look underbaked, this is actually perfect. Sprinkle with the smoked sea salt/sesame mixture and allow to cool for at least 10-20 minutes before eating. In a spice grinder, add smoked sea salt and sesame seeds and pulse until combined. You don’t want to pulverize the mixture, just coarsely chopped enough so that it’s fully mixed together. When you’re craving chocolate, these bars have you covered! My husband is raving about these cookies. Yes, they’re tasty and crunchy but simply the best cookie I’ve made thus far? I didn’t think so, but he says otherwise and I’ll take that from my harshest (only) food critic. I’ll let you decide for yourselves. These are nut-butter cookies because they’re made with a combination of almond and cashew butters, though I’m sure substitutions (all almond butter, peanut butter, etc) would work just fine. Cashews are a bit more mellow in flavor than almonds (in my opinion) so using cashew butter really balanced the strong almond flavor of these cookies. Add chopped dark chocolate and crisp brown rice (or Rice Crispies) and you’ve got a cookie with lots of flavor and tons of texture. Top with flaked sea salt for good measure. 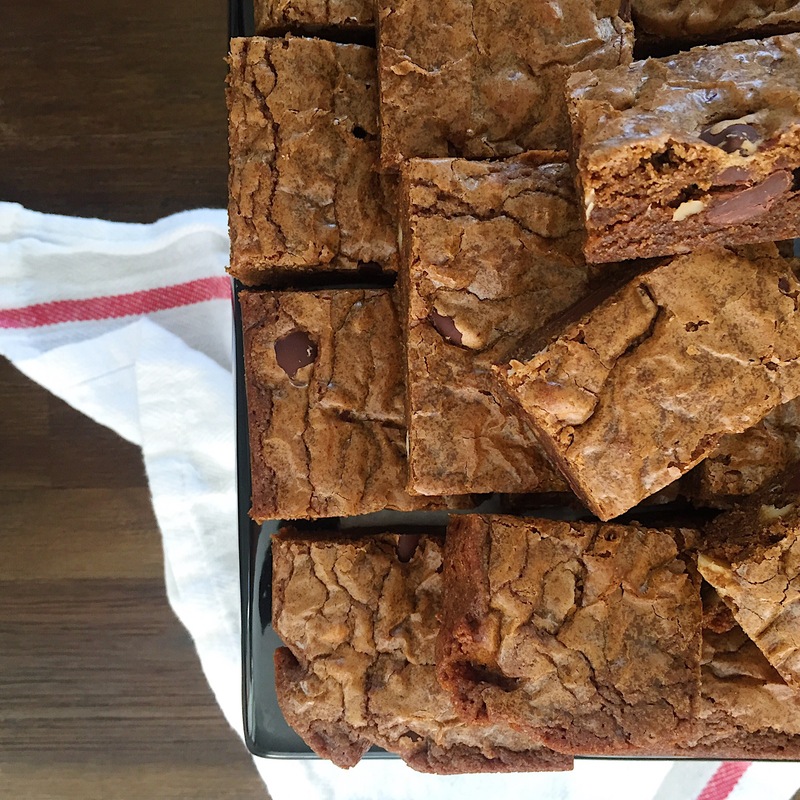 They’re chewy, crispy and chocolaty…you should totally do it. Happy weekending! These come together in a snap and substitutions are welcome. If you don’t have cashew butter, 1 cup of almond butter can be used instead. Or peanut butter. Or any nut butter, really. Don’t skip the crisp brown rice. Combine nut butters with both types of sugars in a large bowl until everything is combined. Add in the egg and stir until fully incorporated. Add vanilla, baking soda and salt. Add chopped dark chocolate and crisp brown rice. Stir to combine. Using a cookie scoop, scoop the dough onto a cookie sheet lined with parchment paper. I then rolled each cookie dough ball between my hands to make sure they were all uniform in size and would spread evenly. Bake for 10-12 minutes, until golden brown around the edges. Let them cool completely on the cookie sheet before removing them. Store in an airtight container and they should keep for about a week.